Acne vulgaris is one of the most frequently treated illnesses in dermatology practices. The treatment is usually lengthy and sometimes associated with substantial side effects. Young people affected usually suffer severely from this. Acne is primarily an illness of the sebaceous gland follicles, which are located predominantly on the face, back and chest. At first, they create non-inflammatory blackheads, but later a series of inflammatory efflorescences such as papules, pustules and lumps can also develop. Acne vulgaris or “common acne” is caused by increased androgen levels during puberty and subsides when the patient enters their thirties at the latest. The most common therapy includes repeated antibiotic and antiseptic treatment, abscess splitting as well as scar excision and wound coverage using split-thickness skin grafts. Disadvantages of this procedure include recurring relapses, repeated small or large-scale surgical procedures, pain, necessary bandage changes, loss of work time due to calling in sick and mental stress with possible subsequent limitations of social contact. 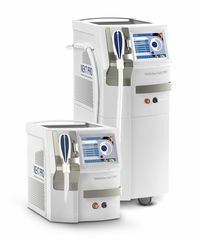 Laser treatment using a diode laser such as the MeDioStar NeXT Family offers a good alternative therapy option. Similar to hair removal, the infrared radiation of the laser penetrates deep enough into the skin to reach the sebaceous gland follicles. Porphyrin-forming bacteria and fungi considered to be local causes of acne are destroyed in this procedure. The light destroys the bacteria that live in the skin and cause acne and leads to the shrinkage of the inflamed sebaceous glands. The pustules begin to clear. The skin condition will improve after a series of treatments.